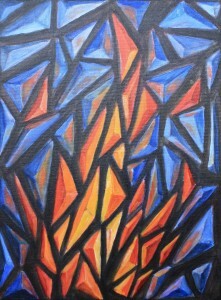 In this painting I wanted to capture fire in a cubist or modular type of way. I tried to bring out the triangular shapes we see in fire and make a type of rhythm out of it. Also, I wanted to show the luminosity and vivid color of a light source within the flame. The light source comes from the center, similar to Van Gogh’s Potato Eaters. The name “Ancient Flame” comes from the idea of a flame with in all of us that was lit long ago. It’s a passion that causes us to create. A force that causes us to strive to contribute to the world and not just to worry about our own life. Like always, you may have a whole different interpretation and that is great! I am just presenting an idea that you can run with and hopefully be inspired by.